Since Zelph brought up Tallbloke, I thought I would share another project I made a few weeks back. It is another military kettle. I call this on the "RR UFO Kettle". It is a different shaped kettle and the chimney is much shorter than the my other kettle. To compensate, I attached a group of aluminum leg/fins to the outside of the chimney bottle that spread out thru the inside of the kettle, hoping to take advantage of some radiant heat from the chimney if that makes any sense. Testing did not go as well as planned using a a small wedding tin burner. Too much heat was lost straight up the chimney. I thought a stove with a wider flame pattern will do better in order to also heat the bottom of the kettle. Tonight, I used a Trangia that not only went up the chimney but heated the bottom of the kettle and used the TriCastle stove as my pot support. I was able to obtain a boil and will do further tasting to get some numbers. This kettle will hold more water than my first kettle. I think it is about 3 1/2 cups. Here are a few pics to give you a idea of my project. Stand back, she's getting ready to take off here! Now all it needs is some revolving lights around the side and a couple little green men to guard it. it would be very cool if the pot would whistle when the water boiled. nice work RR. 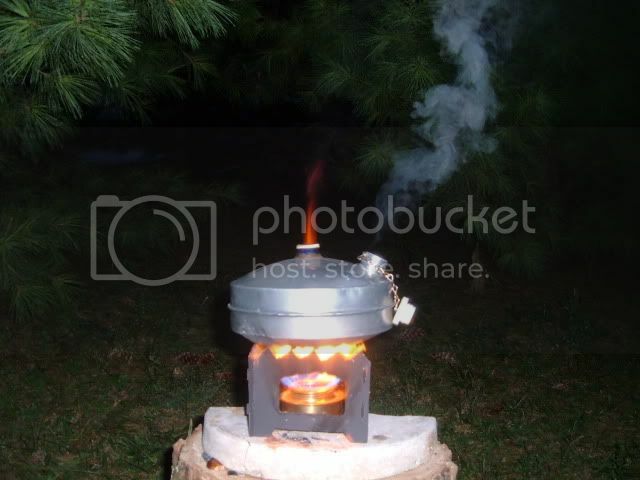 a cool stove. how does it do with a wood fire? DarenN wrote: it would be very cool if the pot would whistle when the water boiled. I bet i could salvage a whistler of a teapot if I could find one close in size I'm sure wood would work fine but I did not feel like blackening the kettle just yet ! Great idea!!!! 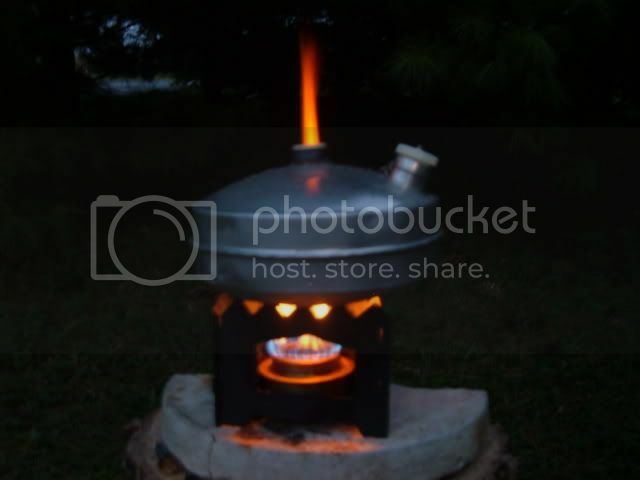 Looks cool how all the flames are directed to the center hole of the pot. I made a large alcohol burner out of one of those canteens. Second test burn caused me to have a jb weld failure around the central wick holder. How is you weld holding out to direct heat/flames? I was cleaning up a memory card and realized I had not loaded these two construction pics of the RR UFO Kettle. You can see how I went about using radiant heating fins to conduct more heat internally. Don't ask how I got them in the kettle 'cause it was a pain in the tush ! Ridgerunner wrote: I was cleaning up a memory card and realized I had not loaded these two construction pics of the RR UFO Kettle. You can see how I went about using radiant heating fins to conduct more heat internally. Don't ask how I got them in the kettle 'cause it was a pain in the tush ! Looks like a pain in the tush, glad it was you and not us. Ridgerunner wrote: Since Zelph brought up Tallbloke, I thought I would share another project I made a few weeks back. It is another military kettle. I call this on the "RR UFO Kettle". It is a different shaped kettle and the chimney is much shorter than the my other kettle. 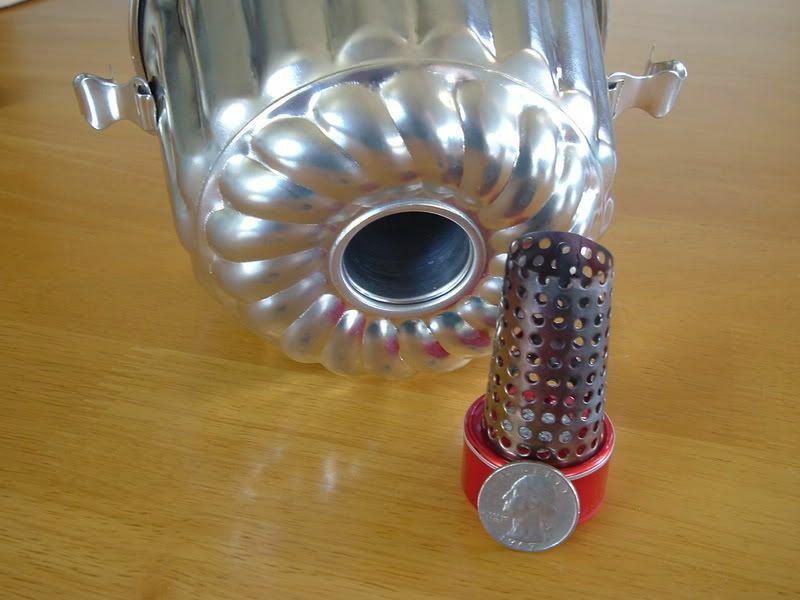 To compensate, I attached a group of aluminum leg/fins to the outside of the chimney bottle that spread out thru the inside of the kettle, hoping to take advantage of some radiant heat from the chimney if that makes any sense. Testing did not go as well as planned using a a small wedding tin burner. Too much heat was lost straight up the chimney. 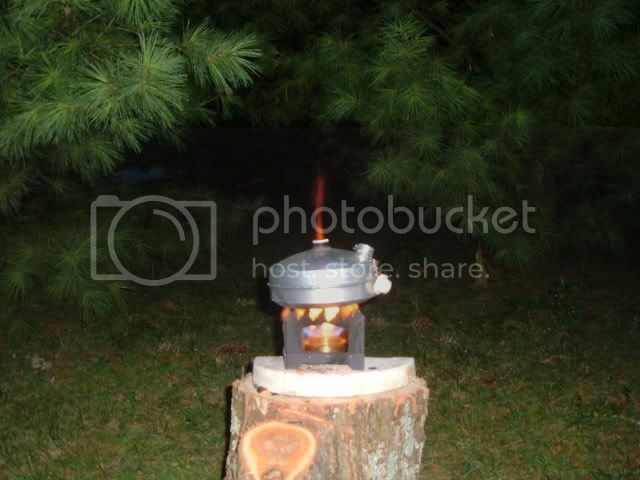 I thought a stove with a wider flame pattern will do better in order to also heat the bottom of the kettle. Tonight, I used a Trangia that not only went up the chimney but heated the bottom of the kettle and used the TriCastle stove as my pot support. I was able to obtain a boil and will do further tasting to get some numbers. This kettle will hold more water than my first kettle. I think it is about 3 1/2 cups. Here are a few pics to give you a idea of my project. I had to pump this one up while you're still on board. That kettle is interesting!!!! Zelph, I have always had a facination with the volcano kettles. I gues this is why I have bought a couple and made a few DIY creations. Your canteen creation made me think of a "bundt pan" maybe there is a possibility in using one as part of a kettle. Let me look up "stilleto" burner or stove. Ridgerunner wrote: Zelph, your making me hungry. Interesting thought- ------Bundt pan will easily hold 2 cups of water. What are the possibilities of quicker boil times using a bundt pan and a stove setup that sends heat up the shoot AND across the bottom and up the sides Might be onto something. That will give you retirees something to test in the lab tomorrow while the rest of us are in the sweatshop helping fund your SS. (Quote) This little burner got its name from the shape of its flame pattern. I'm just playing around with this idea, it's not going anywhere yet. I tried it out on a Heineken pot, it has a bottom that is concave and it lends itself just right for the height of the burner and pot stand. Boiled 2 cups of water using 1/2 ounce of fuel under ideal kitchen conditions. Did not time it. Did not weigh it. Still under construction. 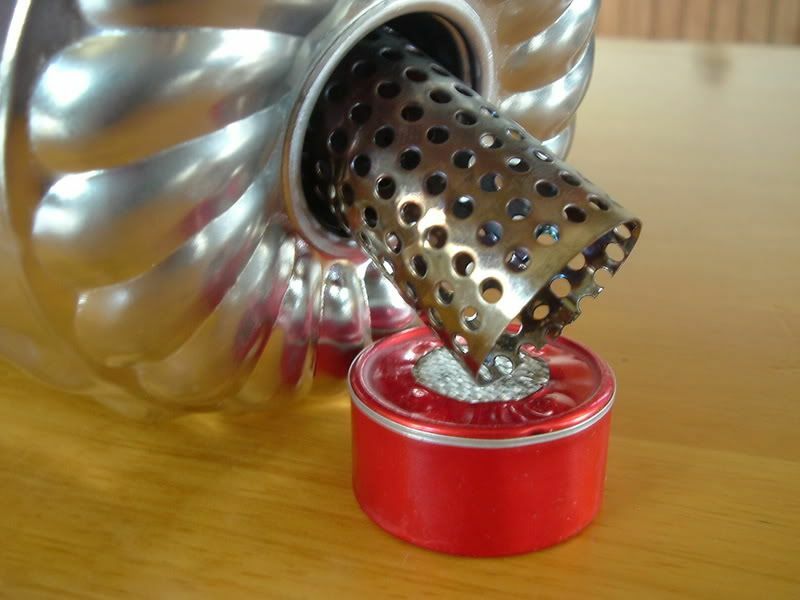 The cone shaped generator is made of stainless steel. Gets red hot and I suspect it may be aiding in efficiency of the fuel consumed as it passes through it. Venturi effect may be present to increase veloscity of heat impinging upon small concave bottom of pot, I don't know. 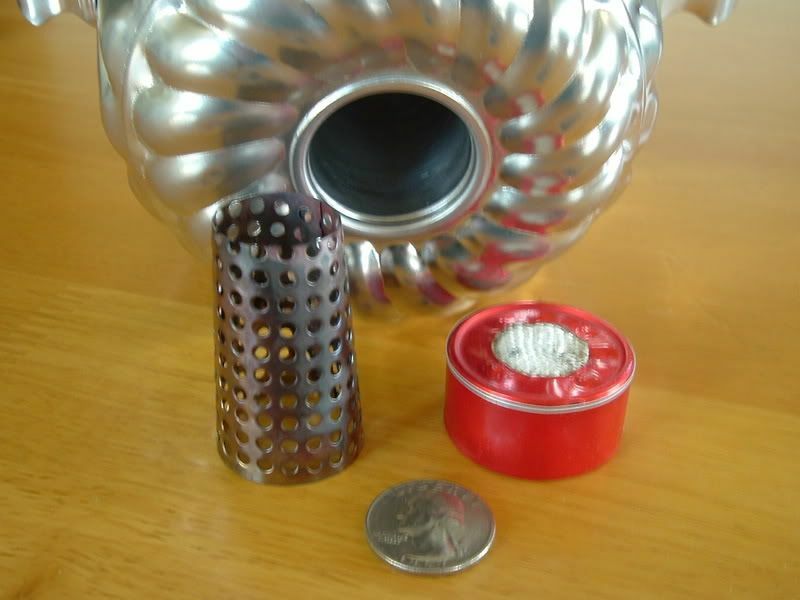 Its base is made of aluminum tins(2) stuffed with cotton. Cotton gets consumed if let to burn. Blow it out before fuel gets low and the cotton will last longer. I'm not really sure whats going on with this devise, maybe losing some there but gaining heat retention inside the pot. Something out of the ordinary happening inside the pot. When the water temp is around 200, the water begins to boil in an area the size of the pinpoint flame(size of a nickle) large boiling size bubbles are coming up the center of the pot in a column. The photos show the flames being shmoshed when hitting the bottom of the pot, but as the flame calms down it gets more focused and seems to really zap a small area. The fuel tin only has a 3/4 inch hole in the center. Under normal conditions the flame is only 2 1/2 in. max. The cone is small, but packs a pretty good consentrated punch. Boil time decreased by 3/4 min. maybe its the Venturi syndrone. When the stainless cone becomes red hot it has probably absorbed as much heat as it can and then does it aid in complete combustion of the vapors that pass through it? 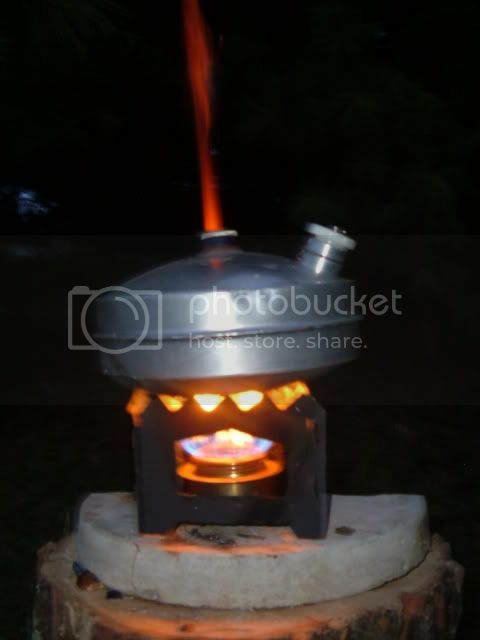 When the burner runs out of fuel does the latent heat in the cone given off go upwards to continue to heat the pot/water? How many times have we gotten sidetracted only to come back to our stove and the fuel has run out and our ramen noodles are patiently waiting for us to get our act together and proceed with dinner? All things considered, I think 1/2 ounce of fuel does ok for itself. There are a few of use that know the capabilities of the 1/2 ounce of fuel. 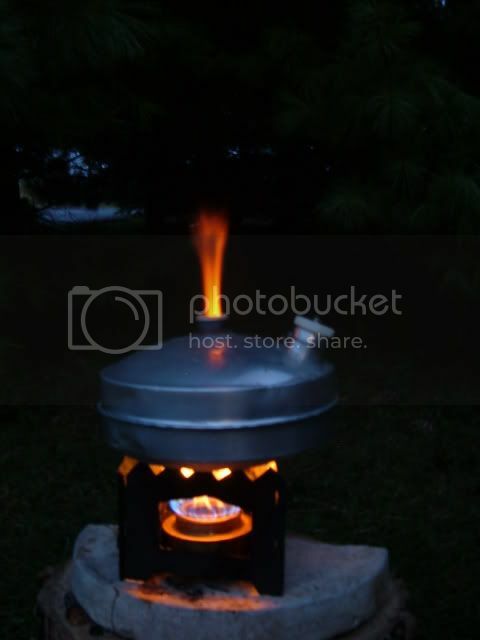 How many of us are concerned about the flames going up the side of the pot reducing the efficiency of the stove? We get overly concerned about keeping the flame only under the pot, this thread is for those that are in that mind set. This info will help someone in their research. Now we can take this design one step further and add another element. A POT designed to capture heat in its center. We have a burner that might just do what we want the pot to do. The "Cone of Fire" fits well into the pot cone. DWM is shaking his head again , another cone thing? These photos will give some idea of what might be possible if perfected. These items that you see are experimental for testing theories. We can speculate at this point what may come about after the testing is done. The pot with the hole in the middle is not my idea, when I go back into a thread and find the info I'll post his name and give him the credit. The pot that you see in the photos holds 4 cups of water. The pots central cone does'nt have a hole in it and will be tested in that fashion first. Heat will be introduced into the cone from the bottom and will flow up and down and out to the bottom of the pot and then flow outward to the sides of the pot.